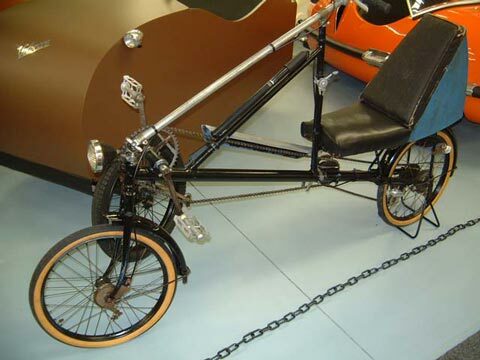 The four-wheeled, pedal-powered Velocar was designed to bridge the gap between the light car or cyclecar and the bicycle. Bicycles at the time were heavy steel-framed constructions, and the Velocar was somewhat lighter than two bicycles while offering the comfort of a bench seat as opposed to a saddle. It was sociable, and one could rest while the other took turns pedaling. A remarkable discovery was that one could push on the pedals with considerably more force than a regular bicycle, as one could push against the backrest, versus simply relying on body weight to push down with gravity. 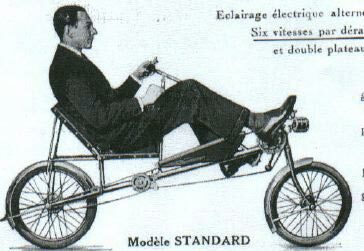 Charles Mochet then decided to bridge the gap between Velocar and bicycle, by splitting the Velocar in half, discarding the bodywork,and leaving the driver sitting comfortably in a horizontal position. The design, which worked amazingly well, was intensively developed in the '30's, resulting in a large number of speed records being broken. The two-wheeled Velo-Velocar ("Velo"=bicycle), nowdays called a Recumbent Bicycle (or "Bent"), was unbeatable. So much so, that the Union Cycliste International changed the rules in 1934, barring "unconventional" bicycles from competing in all events. An embittered Mochet blamed the manufacturers of conventional bicycles and professional cycle racing organizations for conspiring against him. Charles died in 1934, leaving his son Georges to carry the flag, which Georges did very well, and continues to do to this day. Recumbents are today enjoying a huge worldwide renaissance.